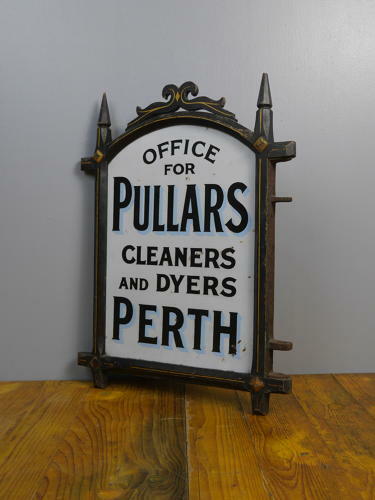 A wonderful, early & very rare enamel advertising sign for Pullers Dye Works, Perth. A cracking example of the iconic Dye Works signs, in it's original & nearly always absent, ebonized wooden frame with twin spires, all original paint & & gilt detailing. The sign itself double sided with the design differing slightly on each side & was manufactured by The Defiant Enamel Company of London. A beautiful & extremely rare sign. Wear commensurate with age, excellent overall with light loss to the tip of one of the spires on the frame & one small wooden stud missing from each side, otherwise both the sign & frame are in great order. Unrestored.